So, you are dedicated to sweat your way out of those extra flabs and love handles, right? Then, you have probably heard of sweat suits—those funky-looking tracksuits that caused a lot of celebrities to keel over in a faint in the 80’s and 90’s. Luckily for you, the sweat suits of today have come a long way from those. Aside from maximizing heat retention capabilities, they now come in a lot more, uh, favorable looking designs as well as providing for a good range of motion. However, not all sweat suits are created equal. Sure, they might all look a lot similar to variations in color and material but really, there are sweat suits that are just a waste of money, ripping apart the moment you put them on. This is why I put together this guide for you—the best sweat suits for men—so you don’t end up wasting your money on a sweat suit that will rob you blind before it helps you to lose weight. What is a Sweat Suit? Is Using a Sweat Suit Too Dangerous? Aside from looking funky, sweat suits or sauna suits can help you maximize your workouts by boosting your metabolism. This, in turn, will enable you to shave off a couple more of those stubborn pounds with every workout. Among the sweat suits available on the market—and there are a lot of them, believe me—these are the ones that made it to my list. If ever you find yourself trying to lose a couple more pounds, try giving one of these a spin in your next session. If you think about the principle, then just wearing a bunch of plastic bags should probably do the same thing a sweat suit can do for you. However, a couple of trash bags are going to make you look pretty foolish. Worse, they may even cause overheating and its dire consequences. In short, a badly made sweat suit can be dangerous. The original sauna suits by Kutting Weight are made of neoprene, which allows for a bit of ventilation to let out that excess heat. Not only that, but it has ventilation zones to let out all that extra heat. The sauna suits by Kutting Weight have also been proven in several studies to increase metabolism by up to 20%. This means that science has proven that these things work to help you shave off those last stubborn pounds. If the design is your concern, then there’s not much to worry about either. These neoprene sweat suits look nothing like the sweat suits of the 80’s—thank God! They are also much more flexible and durable, able to withstand those high-intensity exercises without compromising your movements. Unlike women, who probably enjoy a lot more color in their gear, I know a lot of men would prefer their workout clothes to be a bit low key. 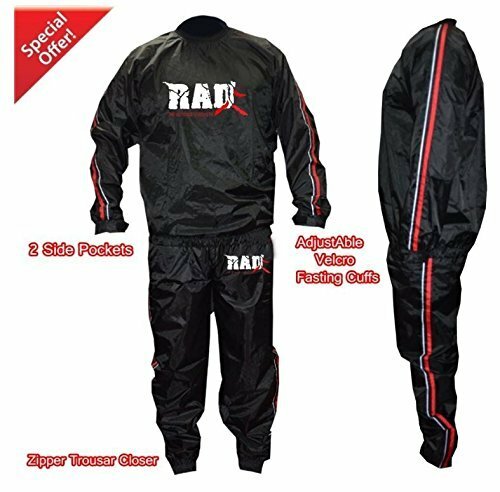 These sweat suits from RAD resemble a jacket with a hoodie and drawstring jogging pants. It’s black with red accents and the company logo emblazoned on the chest and the left upper leg. It is actually designed to be a unisex suit. The cuffs are elasticized and the pants have drawstrings that you can pull to adjust to your size. Once you start using sweat suits in your workouts regularly, you are bound to lose weight. This adjustability means that you don’t have to buy a new suit after shedding a couple of pounds. Just put it on and adjust it to fit. These suits are made of EVA nylon and are guaranteed to be durable enough to last you for a long time. The double stitching also increases its durability so you can do a lot of exercises and rest assured that your suit will hold up. In fact, these suits are even sturdy enough to be machine-washed. Like the Heavy Duty RAD Sweat Suit, this sweat suit from 2Fit® does not have a lot of frills and fanciness to it. It basically does what a sweat suit is supposed to do—increase metabolism during workouts and make you sweat a lot—and that is basically it. 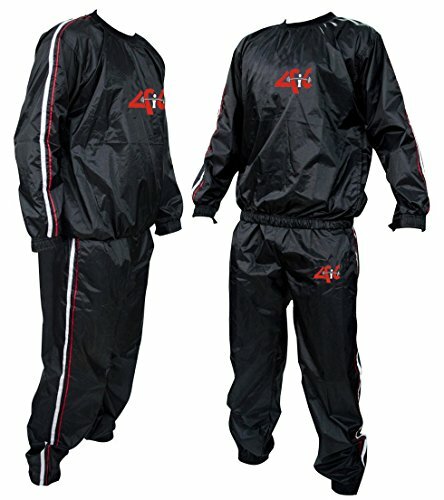 These sweat suits are made of nylon and PVC-coated fabric to trap the heat in while you exercise. 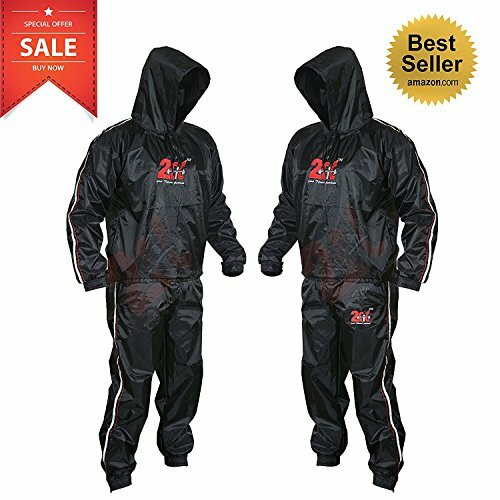 It is pretty durable compared to other cheaper sauna suits that basically come apart while you are still putting them on. It comes with a jacket and hoodie as well as drawstring pants, which you can adjust to fit you. The cuffs are also elasticized. With regards to design, I would say it looks pretty much like a matching set of a jacket and jogging pants. It is black with white strips down the sides of the sleeves and the pants for a more athletic look. The manufacturer’s logo is also printed on the chest and the right upper leg. 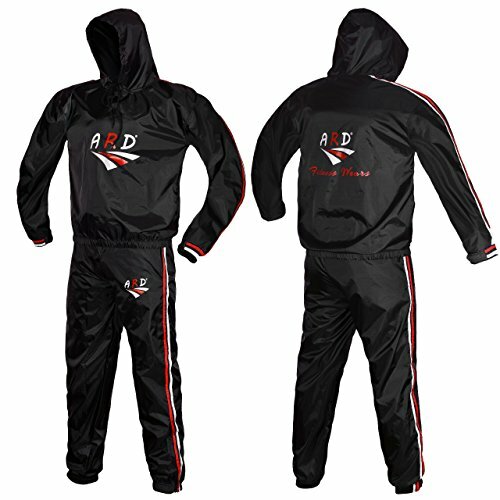 If you’re looking for a nice, reliable companion on your journey to fitness, then you might want to get yourself a set of the RDX MMA Sauna Sweat Suit. With its blue and black design, it adds the right amount of color to your workouts without being glaring. The jacket comes with elasticized cuffs and a drawstring hoodie to trap in more heat, raising your metabolism and making you sweat the way a sauna suit is supposed to. The pants also have a drawstring, which you can adjust to fit your waist, especially when you start sloughing off the extra padding with every workout session. These suits are made of a nylon fabric which conceals the PU inner to maximize heat retention for that metabolism-enhancing boost to your workouts. The material is pretty durable enough to be machine washable and is resistant to tearing. It can be a bit tricky to get out of it the first few times, though. 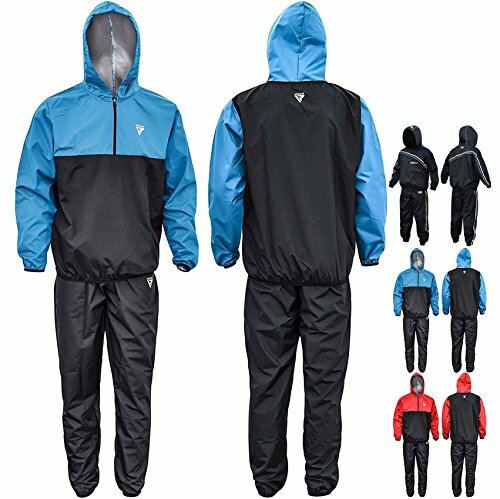 A sweat suit is designed precisely to retain the heat produced by the body. This heat retention boosts the metabolism and helps you shave off excess pounds in the process. Based on this, you can pretty much just use a couple of garbage bags and sweat your way through it, right? If you’re just going to stay at home where nobody will see you wearing an outfit made out of trash bags, then this should serve the purpose. However, trash bags are not very durable and will probably not allow you a great deal of movement. However, a dedicated sweat suit like this Heavy Duty Sweat Suit from 4Fit will allow you to sweat out those flabs without hampering your movement too much or making you look like total, uh, garbage. This durable outfit is geared towards maximizing your workouts or even just your household chores. Where a garbage bag can restrict your movement and rip easily, this sweat suit is made to withstand even your high-intensity workouts. It is even machine washable so cleaning up is pretty easy—just throw it in the wash and it’ll be fine. If the baggy hoodie and drawstring pants combination is not to your liking, 4Fit Inc. offers another design that might be more to your tastes. 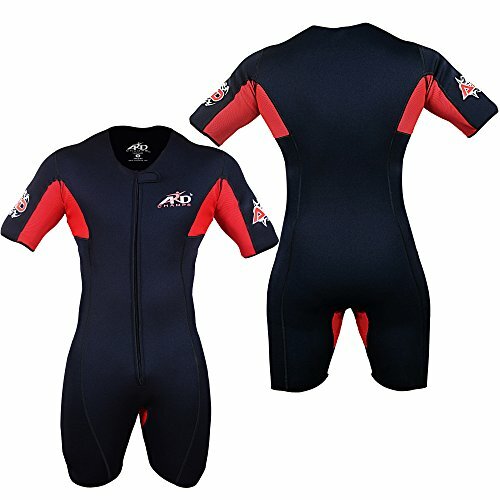 This neoprene sweat suit resembles a rash guard and is a lot more form-fitting than their Heavy Duty Sweat Suit. 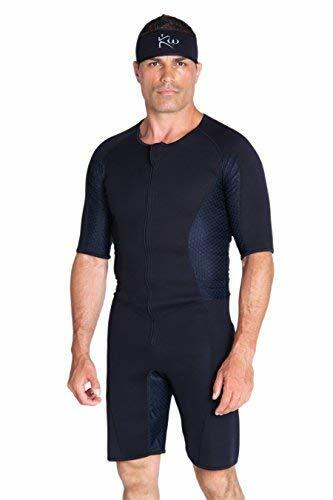 Unlike the rubberized lining of the Heavy Duty Sweat Suit, this one is made of 3-millimeter extreme Flex DS Neoprene, which is a lot more flexible than PVC and nylon sweat suits, allowing for a greater range of motion when exercising. This same material effectively retains the heat your body produces during workouts to further boost your metabolism and your ability to lose weight. In short, it maximizes the weight loss from your exercises while affording you an unlimited range of movement. Unlike PVC and nylon, neoprene is also a more breathable material. While it may effectively lock in the heat you produce during your workouts, it also allows the excess heat to escape, preventing the dire consequences of overheating. You might want to write this off as just another generic sweat suit that looks like an upgrade from a DIY sweat suit made out of garbage bags. But garbage bags are not exactly comfortable, do not afford a great deal of movement, are single use and definitely bad for the environment! This Heavy Duty Sweat Suit from ARD-Champs resembles one of the more stylish tracksuits you see celebrities sporting on their morning runs. Under all that, there is a concealed unique EVA nylon material to trap the heat your body produces during workouts and boost your metabolism. This sweat suit has a unisex design but the manufacturers advise you to get an oversized one. Don’t worry, though, because the hoodie and pants come with drawstrings, which can be adjusted to fit you. This adjustability is especially helpful when you lose weight. Instead of having to buy a new suit, you simply have to pull the strings tighter to fit you. Sizes, especially the tops, run a bit small. ARD-Champs advise consumers to get a more oversized fit. Now, I can see that this is a sweat suit that truly gets it! Where most sweat suits feature unisex designs, the guys over at TNT Pro Series acknowledge the fact that men are different from women in more ways than one. This is why they came up with this neoprene sweat suit that is made specifically for men. This sweat suit is made of a thick, stretchy neoprene material that is excellent for retaining the body heat produced by exercise but still flexible enough to allow a great range of motion for your exercises. With their revolutionary Comfort-Fit Technology, these guys take it a step further by using your body heat to mold the material into your body. This hits two birds with one stone—body heat retention and unrestricted movement. Not only that, this sweat suit is pretty breathable, too. Before you go off thinking that it defeats the purpose of a sauna suit, let me tell you it does not. It still keeps you pretty warm, boosting your metabolism and burning off excess fat, but prevents overheating and all its nasty consequences like dehydration and heat stroke. A sweat suit, also known as a sauna suit, is a waterproof garment that is designed specifically to make the wearer sweat a lot. The first sweat suits were also called rubber suits because they were previously made of rubber or a rubberized type of cloth. These funky suits are now usually made of PVC and look a lot better than the previous rubber suits. Even celebrities have taken to wearing them as a fashion statement. These suits typically consist of a jacket and drawstring pants. The closures are generally elasticated and designed to retain more heat. Some of them even have a hood to maximize heat retention! Because the sweat suit is designed specifically the way a sauna does—it makes you sweat a lot. This sweat is believed to carry all those nasty toxins from your system and out your pores. We all know that anything that promises to help you accomplish anything the easy way is more or less a hoax. When I first came across the concept of sweat suits, I was naturally skeptical. I mean, sure, it helps you lose weight by sweating but isn’t all that water weight regained when you rehydrate? Besides, if you lose a certain amount of fluids from overzealous sweating, you are going to run the risk of dehydration, electrolyte imbalance, heat stroke, or all of the above. So, let me get this out of the way—sweat suits are not a magic pill that will make you lose weight. In fact, sweat suits carry a risk if you use them improperly. However, they can help you lose weight, provided they are used properly. In August 2017, a study was conducted on 14 people to test if training in sweat suits can possibly help athletes acclimate to warmer temperatures. The results showed that short-term training in sauna suits does help with heat acclimation, as well as boost physical endurance. If you live in a tropical country like I do, this might not seem like much of a big deal. However, if you live in colder climes and need to compete in a country like mine, then training your body to acclimate to the local environment using a sweat suit can help with your performance. A more recent study sponsored and published by the American Council on Exercise in November 2017 showed that sweat suits can help you maximize your workouts. Yes, you. Not just athletes, like in the previous study but you. This study used a brand of sweat suits made of Neoprene—not very different from a wetsuit—and included 45 overweight and obese participants. These participants had a BMI of 25 to 40 kg/m2 (normal BMI ranges from 18.5 to 24.9 kg/m2) and had a body fat percentage of at least 22% for men and 32% for women. Not only that, the participants were all considered sedentary, meaning they led a lifestyle with little to no physical activity. They were then divided into three groups—the control group, the exercise group, and the sweat suit group. The control group basically did nothing and went on with their usual activities (or inactivity), while the exercise and sweat suit groups performed similar progressive exercise programs. The key difference is that the sweat suit group had to do everything while wearing their sweat suits while the exercise group wore regular workout clothes. By the end of the study, it came as no surprise that both the exercise group and the sweat suit group both managed to lose weight. Several weeks of exercise can give anybody such benefits. What is surprising is that those in the sweat suit group showed significant results not only in weight loss and a decrease in body fat percentage but also boosted cardiovascular endurance. In short, this study showed that wearing a sweat suit during exercise can not only result in weight loss but can enhance physical fitness. The use of sweat suits also come with risks. You might have heard of some celebrities in the 80’s and 90’s fainting from exhaustion and dehydration while working out in their sweat suits. Truthfully, sweat suits can be a nuisance when working out and the funky style of it might turn off some people. However, the greatest danger in wearing sweat suits stems from overzealous exercising to the point of dehydration and heat stroke. Sweating profusely can result in dehydration and electrolyte imbalance. Dehydration can be dangerous as it will cause your kidneys to shut down, resulting in acute kidney failure. If you use a sweat suit in the sweltering heat, you also run the risk of getting heat stroke, a particularly dangerous condition wherein the body’s temperature-regulating mechanisms fail due to extremely high temperatures in the environment. Well, any fitness regimen carries a certain amount of risk. Exercises and routines that are implemented improperly can result in injury. In the study mentioned previously, all exercise routines and participants were carefully monitored and none of their workouts exceeded 45 minutes. If you are planning to incorporate a sweat suit into your exercise routines, it is advisable that you should keep yourself hydrated and only use the sweat suit in an air-conditioned facility or when the weather is particularly cold. Make sure that you drink a lot of water before putting on the sweat suit. During exercise, keep yourself hydrated by drinking every now and then. Then drink some more after taking off your sweat suit. Don’t worry if you feel a bit heavier from all that water. Remember that whatever weight you lose quickly during a session with your sweat suit is most likely water loss. This isn’t the kind of weight loss you are after. The fat-burning effects of sweat suits do not happen within a 30-minute session and you should not expect it to. If you are feeling particularly unwell, you should take off your sweat suit immediately and seek medical help. A sweat suit or a sauna suit is particularly helpful when you are trying very hard to lose weight. These suits work by trapping the body heat you produce while you are working to boost your metabolism and help you sweat out those toxins. However, they do come with their own risks such as dehydration, electrolyte imbalance, and heat stroke brought about by overheating. Because of this, it is very important to keep yourself hydrated while working out, avoid using your sweat suits in warmer conditions, and, of course, choosing the right kind of sweat suit to help you crush your weight loss goals. For this, the Original Kutting Weight Men and Women’s Sauna Suit is your new best friend. Unlike all the sweat suits out there, this is the one that has been proven to boost your metabolism and fat-burning capacity by up to a whopping 20%. This suit, made of neoprene, is designed to trap heat while providing unrestricted movement during your workouts. It even has ventilation zones to let out the excess heat, preventing overheating and its nasty effects on your body. It might be a bit expensive but it is pretty durable with triple reinforced stitching, making it a good investment still. Do you use a sweat suit or sauna suit during your workouts? What brands, designs, or materials do you prefer? Let us know your thoughts in the comments below!